← SAN DIEGO PADRES MADE THE NATIONAL NEWS! This might come as a shock, but I freaking love this. 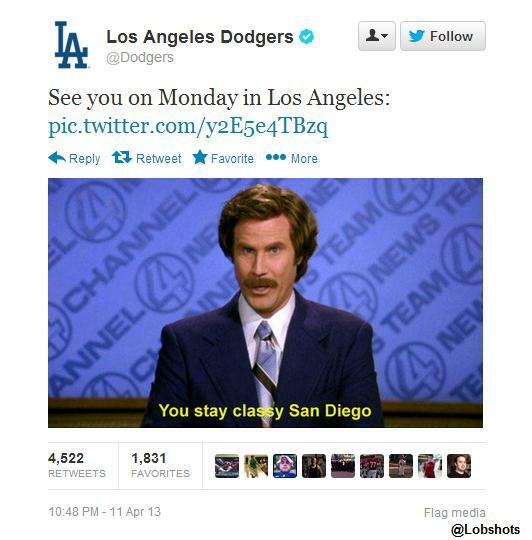 I mean, aside from the “You stay classy, San Diego” line being old and tired… I love this. Troll away. Light the fire. Get pumped up. So many professional sports team twitter accounts are afraid to have a little fun because they’re “official.” Who cares? Stir the pot! I hope this pisses Selig off. I hope it pisses the Padres off. Game on. This entry was posted in Baseball, MLB and tagged anchorman, Dodgers, dodgers twitter. Bookmark the permalink.